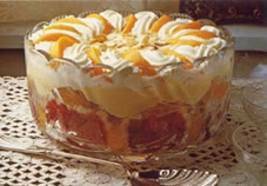 A perfect trifle should be a rich confection of fruit, light sponge, alcohol, real egg custard and whipped cream. The recipe has altered little over the centuries - at one time the custard was topped with syllabub, and fruit has not always been added. Spread cut up cake pieces with jam, then sandwich together. Arrange in the base of a glass serving dish. Cover with cookies or wafers and sprinkle with sherry. Coat the bananas in lemon juice. Arrange the bananas and cherries on top of the cookies or wafers. Heat the milk until almost boiling. In a large bowl, whisk together the eggs, lemon zest and sugar until pale, then pour on the hot milk, stirring continuously. Return to the saucepan and heat gently, stirring continuously, until the custard thickens enough to coat the back of a wooden spoon. Do not allow to boil. This takes about 20 minutes. Set aside to cool. Pour the custard over the trifle and refrigerate until cold. Pipe the cream on top of the custard and decorate with sliced peaches and nuts. Serve chilled. Store any leftover trifle in the refrigerator.